MENOMONEE FALLS, Wis., March 20, 2018 /PRNewswire/ -- While pay toilets aren't common in the United States, 56% of Americans say they'd consider paying as long as they were guaranteed a clean, well-stocked public restroom. How much, you ask? 45% would drop a quarter, 29% would part with up to 50¢, and 6% are big spenders who'd shell out more than $1. The findings are from a restroom and hand washing survey conducted annually by Bradley Corporation, a leading manufacturer of commercial plumbing fixtures and washroom accessories. 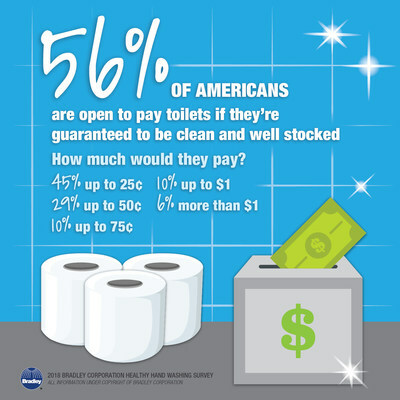 According to a survey from Bradley Corporation, a majority of Americans are open to pay toilets as long as they were guaranteed to be clean and well stocked. 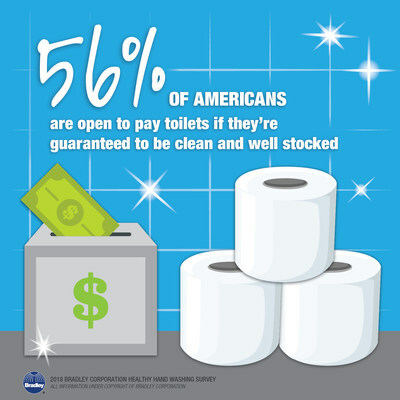 A survey from Bradley Corporation finds Americans are open to pay toilets as long as they're guaranteed to be clean and well stocked. Some would even shell out more than $1 for a premium public toilet. There is a group who isn't too keen on the payment idea. Call it what you like – Midwestern practicality or frugality – but nearly one-third of Midwesterners say they definitely would not pay to use a premium public toilet. The survey also revealed a lack of knowledge. 47% of Americans didn't know that in some countries pay toilets are a common practice. Actually, until 40 years ago, pay toilets were found throughout the United States. Putting out some cash in exchange for cleanliness and plenty of TP might not be a bad thing since 70% of Americans say they've had a particularly unpleasant experience in a public restroom due to the condition of the facilities. In fact, 42% report having a bad experience within just the past two months. Respondents readily shared a list of things that get them riled up. Clogged or unflushed toilets; toilet paper dispensers that are jammed or empty; and partition doors that don't latch are the biggest irritants. When asked what improvements they'd like to see, the top requests were: keep restrooms cleaner and ensure they're adequately stocked with toilet paper, paper towels and soap. The Bradley Corp. survey also found that bad restrooms can be bad for business. More than half of Americans say they'd think twice about returning to a location after experiencing an unclean or unpleasant restroom. For restaurants, the judgment surrounding the condition of restrooms is especially tough since 82% think a restaurant with dirty restrooms is "extremely" or "fairly" likely to have a dirty kitchen. "Our survey found that a bad restroom speaks volumes to customers," says Jon Dommisse, director of strategy and corporate development for Bradley Corp. "47% say an unclean restroom shows the company doesn't care about its customers and 46% feel it's a sign of poor management. On the flip side, we found that almost half of Americans will 'definitely' or 'probably' spend more money at a business that has clean, well-maintained restrooms." For the past nine years, Bradley Corp. has conducted its annual Healthy Hand Washing Survey. This year, the survey queried 1,035 American adults online Jan. 2-5 about their public restroom experiences, hand washing habits in public restrooms and concerns about germs, colds and the flu. Participants were from around the country, were 18 years and older, and were fairly evenly split between men and women (49 and 51 percent). For 97 years, Bradley Corporation has designed and manufactured commercial washroom and emergency safety products, and today is the industry's leading source for commercial plumbing fixtures, washroom accessories, restroom partitions, solid plastic lockers, and emergency safety fixtures and industrial grade electric tankless heaters. Headquartered in Menomonee Falls, Wis., Bradley serves the commercial, industrial, health care, retail, and education markets worldwide. For more information, contact Bradley at 1-800-BRADLEY or www.bradleycorp.com.